Hello, all! 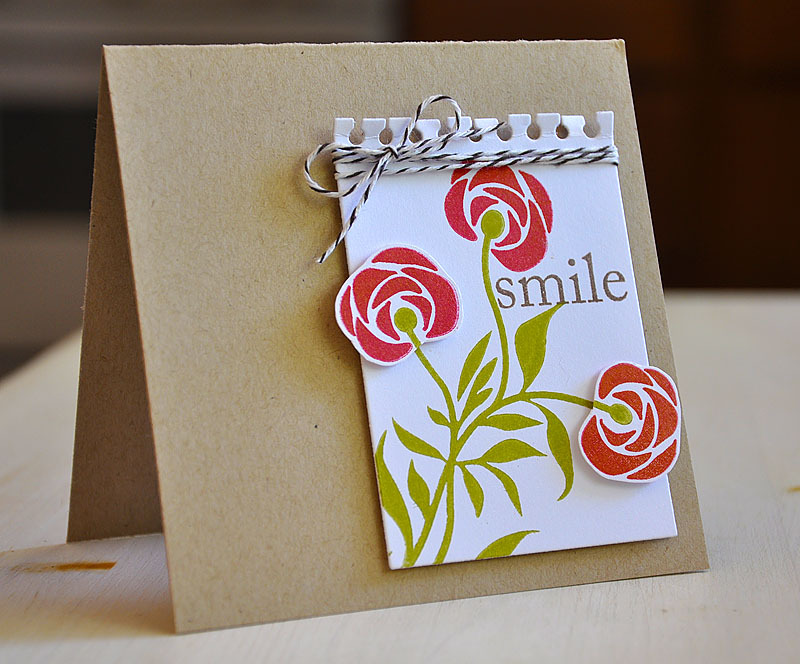 I thought today would be a perfect day to share a couple cards I made for the Papertrey Ink CHA booth. These two cards showcase the exclusive stamp set, Four Of A Kind. 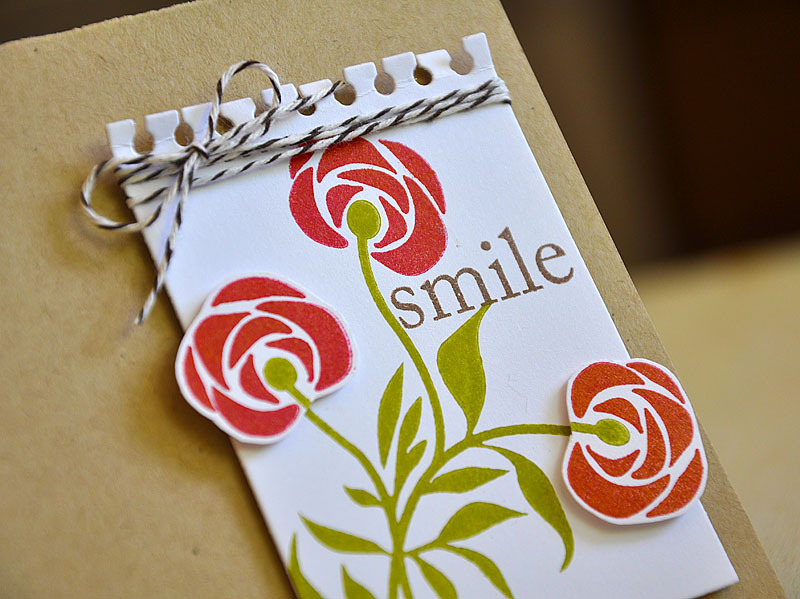 Which was given to customers at the Papertrey Ink CHA SuperShow Booth, who made a purchase of $100 or more. This set will not be available in the store. 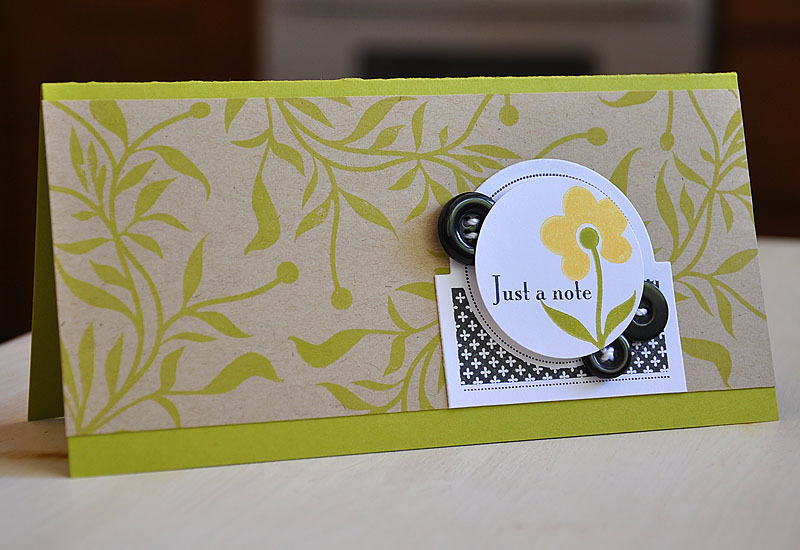 Stamped a die cut spiral notebook sheet with the stem image, in Simply Chartreuse. The flowers were stamped in Pure Poppy onto a scrap piece of cardstock, cut out and attached. Stamped the sentiment in Dark Chocolate, wrapped the notebook sheet with baker's twine and attached it to a square kraft card base. Stamped the stem image, in Simply Chartreuse, onto a kraft cardstock piece and attached it to a Simply Chartreuse card base measuring 7" X 3 1/2". Stamped the Mat Stack #3 in True Black, trimmed the bottom portion off and attached. Punched a circle and stamped it with the single flower stem in Simply Chartreuse, a flower in Lemon Tart and a sentiment (from It's Official) in True Black. Attached it with dimensional adhesive and embellished with a few buttons. At the show, were any of you able to tell which card or cards were mine? There you have it, hope you enjoyed! Have a wonderful one! Saw both of these gorgeous cards in person! I guessed that the second one was yours, but I wasn't sure about the first one. I love them both! Lovely cards Maile! Darn those lucky CHA girls ;) Cant wait for Jan!!!! Oh what lovely cards, Maile! I adore your first one - the dimension you added is fabby!!! These are absolutely gorgeous! I wish I could have been there! simply beautiful! love them both!! thanks for sharing! I've featured your beautiful card on Northridge Media's Create: blog! Thanks for sharing your talents with the www! You are inspiring!